The Smart-Trough® Mosquito Pump changes the surface of the water so that mosquitos are not attracted to it— no carbon dioxide. Only $399 for our COMPLETE Kit with 12v solar panel, Plug-N-Play Ready! Is It True That With Smart-Trough Stagnant Water Comes to Life? No! It’s important to clean your trough completely, and refill with fresh water. 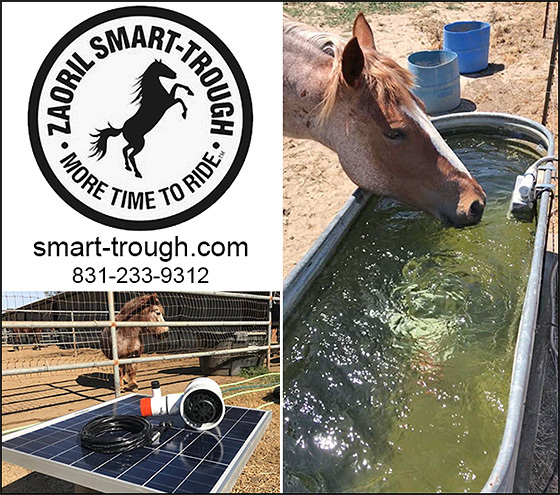 With the Smart-Trough®️ system, water is maintained as it becomes a living self-contained river of moving, clean, fresh water that your horses and livestock will enjoy! But Can Smart-Trough Really Eliminate Mosquitos In The Water? YES! The Smart-Trough® Mosquito Pump changes the surface of the water so that mosquitos are not attracted to it— no carbon dioxide. With the Smart-Trough Mosquito Pump, mosquitos are prevented from landing on the water entirely. This is accomplished by moving the surface of the water, and preventing carbon dioxide from gathering on the surface. C02 is what attracts mosquitos. All of our customers report that bug populations in general have decreased on their property, by having the system in their stock water tank and troughs. But What If Mosquito Eggs Somehow Get Into My Water Troughs? They will no longer go into your water trough if you have the Smart-Trough® Mosquito Pump. Although the Smart-Trough® System prevents mosquitos from ever landing in your trough, we found an opportunity to destroy mosquito eggs peacefully with the pump water flow by attracting them to lay their eggs on the water surface, by adding an organic CO2 producing mushroom by ExhaleC02® -- The Adios-Mosquitos™ Fountain Trap was the result. So How Does The “Adios- Mosquitos”™ Fountain Trap Work? The Adios-Mosquitos™ Fountain trap kit uses the same Smart-Trough® pump under water, but we add an organic attractant that sinks to the bottom containing a mushroom that emits carbon dioxide. The carbon dioxide collects on the surface, and attracts female mosquitos to lay eggs on the water. The pump submerges the eggs under water with flow after they have been laid, when the sun rises and activates the pump. This system is possible thanks to his partnership with Garden City Fungi and The Exhale C02® bag. Nate, designer of Smart-Trough® Mosquito Pump, has partnered with multiple companies across several industries, and understands that teamwork is the ultimate force against any obstacle, interference, or problem. Is There Any Competitor that Can Offer the Same Benefits As The Smart-Trough® Mosquito Pump? No. We can take a horse to water, and they drink…this system is solar powered without a battery, and can be used in any trough between 30-400 gallons. So... How Can The Smart-Trough® Mosquito Pump Encourage My Horse To Drink More? Horses are attracted to flowing water. This system gently rolls the surface of the water to keep it cool and attractive to horses and livestock. The sound of the moving water also has an effect on the horses drinking response. They will drink for 1-5 minutes at a time. The system rehabilitated a rescue horse named Olaf from the SPCA of monterey county. He was taken off his electrolytes and medication after one month of using the Smart-Trough®️ system. Clients reported no more incidents with colic or dehydration! Note: Most horses refuse to drink from little auto-waterers once they have a smart-trough®️mosquito Pump in a water trough. They know the difference, and they will wait to drink from the incredible moving water, their awesome owner upgraded them too. Amazingly enough, it’s increased horse water intake in 100% of all users. Repeat customers and five star reviews are good indicators of a stellar niche product addressing a serious need. Can’t I Just Dump Out The Water Every Week and Not Worry? Frankly, if you dump the water every week to solve the problem, then you are wasting water and making it very difficult to justify efficiency — and some states, like California, are frequently in a drought and rationing water. In addition, you are not addressing the benefits of making the water attractive to your horses via the additions of movement and coolness. Horses love clean, moving, fresh water— just like we do and they can have that 24/7 by installing the Smart-Trough®️ Mosquito Pump in the trough you already own! What About Putting Fish In The Trough Or Tank To Keep It Clean? You use Mosquito fish for your trough? The idea SOUNDS good—but they do an incredible job in ponds, and leave a mess in troughs. Fish create their own problems! First of all, the fish expel ammonia and waste into the water, that your animal then drinks. Then, when the water overheats— or looses oxygen, or freezes, or… or…(you get the idea!) the Mosquito fish will belly up and no longer do mosquito control. And at that point, your animal is drinking water with decomposing fish in it along with mosquito larvae. No veterinarian would suggest you let them drink water in this condition. The Smart-TroughMosquito pump only enhances and cleans the water, preventing a host of problems, and managing its drinkability, contrary to the mosquito fish. Is It True That The Water Will Stay Cooler in Hot Months With Smart-Trough? Yes. Energy in motion stays in motion. When the sun comes out, the solar pump goes to work to keep your trough cool, clean, and attractive. The movement in the water, prevents the suns energy from being stored in the water. A bowl of hot soup explains the method as well; the more one stirs the soup, the cooler it gets. Energy travels faster through water, than through the air. This is why the Smart-Trough Mosquito Pump can maintain a 66 degree temperature in water, while the air is above 100 degrees. Can I Use My Smart-Trough® Mosquito Pump To Help With My POND? Absolutely! The Smart-Trough Mosquito Pump does wonders for ponds. Traditionally water was shot into the surface, or up out of the surface to fall back into the water. Now with solar power, the Smart-Trough Mosquito Pump approach, aims the water flow at the surface of the pond, with flow from beneath the water, and turning that area into a flowing river surface. What Size POND Can Benefit From Smart-Trough? Gallons do not necessarily matter, but depth is important to note, as the system has 13 feet of lift. Post Ranch Inn, located in Big Sur, California, uses six of the Smart-Trough Mosquito Pumps in their famous pond. You can read the fish and game wildlife submittal form here. The Smart-Trough Mosquito Pump system has been approved for use with red legged frogs and other endangered plants and species. It will not pull fish or frog eggs or tadpoles into the filter chamber. It’s designed to be a low-intake, high-output water flow filtration circulation solar pump. Ponds or bodies of water ranging From 18sq inches to 7,000 sq. Ft, have shown a 100% -50% difference with only one system. We recommend one system maintain up to 1,000 sq ft of water surface for optimum performance, but 7,000 sq ft surface area ponds have shown 50% improvement rate, and prevented algae bloom. How Do I Install My Smart-Trough In The POND? First you need to clean all surface algae bloom, plants, and scum, using a rake to pull it to shore. What is the depth of the pond? We advise installing near a shore so you can pull it up for filter cleaning. The depth of the water tells us what length of 3/4” pipe we need. Once you know the depth more or less, obtain a piece of 3/4” pvc pipe and a 3/4” coupler. The pipe will connect to the coupler, and the coupler will go over the black outflow nozzle. No gluing or screwing required. Detach easily for repairs and maintenance. The outflow of the pipe should be 6”-12” below the water surface. The first foot of water is where most problems occur, including bugs, algae, bacteria, and viruses. By mimicking a riverflow on the surface of the water, with flow from beneath, the problems are prevented to improve aesthetics, and ambiance for your pond. Is the Smart-Trough® Mosquito Pump Easy To Install? Yes it is! Plug n play kit, with easy aluminum mounting brackets for the solar panel. First clean your trough as best as you can, and refill with fresh water. This system will maintain the high quality water you already provide for your animal, all while conserving 50% of current water use. Drop the pump into the center of the trough with the black outflow nozzle facing up towards the surface. Locate best location for sun exposure, and Install mounting bracket with provided screws, and then slip solar panel over it. Plug pump cord to solar panel. The mosquito Pump comes with a 20ft cord, but extension cords are available in 50,100, and 300 ft lengths, for the optimum access to solar panel placement. Run the power cord from pump under your float valve, or use 2” pvc pipe and elbows, to conduit into and out of the trough to prevent horses from playing with wire. If the wire is chewed, no electrocution or shock will ensue. It’s a low amp, 12v low voltage system without a battery. Is It True That Smart-Trough® Is SOLAR-POWERED? YES! Smart-Trough is solar powered, portable at 19lbs, battery free, and can be used in any water trough from 30-400 gallons effectively. Prevent mosquitos. Prevent colic and dehydration. Conserve water. Produce Zero-emmision. Increase Yield & Health. Chemical & additive free. No recurring Energy Bill. Never replace filters. Connects to multiple pipes and tubing. Easily take apart system for cleaning without tools. Put back together without tools. Ultimately, this system can be used in ponds, water tanks, water storage, rain barrels, free-flow drip irrigation, spring boxes, artesian wells, pools, hot tubs, aqueducts, tide pools, fountains; any ocean or sea, and any other body of water that you want agitate, pump from, pump to, or pump within. It really is a multi-purpose water pump being used in ways not previously accessible. And— You Only Rinse--NOT “Replace”—The Filter Once Per Month? Yes and what a convenience, time saver and money saver that is! Now…IF your horse is a dunker of feed, you will need to clean the filters every week. Never replacing the filters is one of our main features. Even with weekly cleaning, you are saving between 500-1,000 gallons a month because you don’t have to dump the water! The filters rock n roll out of the filter cannon without tools. This easy take-a-part design allows for easy cleaning with no waste of material. If your horse feed is not near the water trough cleaning ranges from once a month, to twice a year. It all depends on material gathered— you will soon find what works for you! Doesn’t Your Horse Deserve The Cleanest, Most Inviting, MOSQUITO -FREE Water for Ultimate Hydration? We all know the worries about helping horses to drink enough— but if they are ingesting mosquito larvae, worms, beetles, flies, ammonia or waste— they are drinking their way to a potential health problem. The Smart-Trough®️ Mosquito Pump is the easy way to help your horse drink more water, and enjoy the YEARS of health to follow. Stir the stagnant with a 1 time investment of only $399 for our COMPLETE Kit with 12v solar panel, Plug-N-Play Ready! Call- 831-233-9312 and be sure to watch our YouTube channel “Smart-Trough” to see the system in action, and check out our five star ratings on amazon.com.